Smoked Prosciutto; Smoked dry cured ham. Salami Milano; Seasoned pork salami. Salami Ventricina; Spicy pork salami. Salami Napoli; Pork salami with pepper. Made In Italy 8 Smoked Prosciutto, 5 Salami Milano, 5 Ventricina and 5 Salami Napoli Our platter is made by a family run company that has been producing charcuterie for eight generations dating back to 1812. We have worked together for over 20 years to deliver an authentic Italian flavour. Smoked Prosciutto: Pork Leg, Salt, Spices, Dextrose, Antioxidant (Sodium Ascorbate), Fructose, Preservative (Sodium Nitrite), Dried Garlic, Salami Milano: Pork, Salt, Dextrose, Spices, Antioxidant (Sodium Ascorbate), Preservatives (Sodium Nitrite, Potassium Nitrate), Dried Garlic, Sugar, Herbs, Juniper Berries, Salami Ventricina: Pork, Red Chilli, Salt, Flavourings, Dextrose, Paprika, White Pepper, Antioxidant (Sodium Ascorbate), Black Pepper, Preservatives (Sodium Nitrite, Potassium Nitrate). Salami Napoli: Pork, Salt, Dextrose, Black Pepper, White Pepper, Antioxidant (Sodium Ascorbate), Preservatives (Sodium Nitrite, Potassium Nitrate), Dried Garlic. Smoked prosciutto Prepared from 137g of Pork per 100g of Smoked Prosciutto, Salami Milano Prepared from 146g of Pork per 100g of Salami Milano, Salami Ventricina Prepared from 131g of Pork per 100g of Salami Ventricina, Salami Napoli Prepared from 146g of Pork per 100g of Salami Napoli. Salami milano; Seasoned pork salami. Salami Milano; Seasoned pork salami: Pork, Salt, Dextrose, Spices, Antioxidant (Sodium Ascorbate), Preservatives (Sodium Nitrite, Potassium Nitrate), Dried Garlic, Sugar, Herbs, Juniper Berries. Salami Napoli; Pork salami with pepper. Salami Napoli; Pork salami with pepper: Pork, Salt, Dextrose, Black Pepper, White Pepper, Antioxidant (Sodium Ascorbate), Preservatives (Sodium Nitrite, Potassium Nitrate), Dried Garlic. Prepared from 146g of Pork per 100g of Salami Napoli. Keep refrigerated. Once opened, consume within 2days and by 'use by' date shown. Salami Ventricina; Spicy pork salami. Salami Ventricina; Spicy pork salami: Pork, Red Chilli, Salt, Flavourings, Dextrose, Paprika, White Pepper, Antioxidant (Sodium Ascorbate), Black Pepper, Preservatives (Sodium Nitrite, Potassium Nitrate). Prepared from 131g of Pork per 100g of Salami Ventricina. Smoked Prosciutto; Smoked dry cured ham. Smoked Prosciutto; Smoked dry cured ham: Pork, Salt, Spices, Dextrose, Antioxidant (Sodium Ascorbate), Fructose, Preservative (Sodium Nitrite), Dried Garlic. 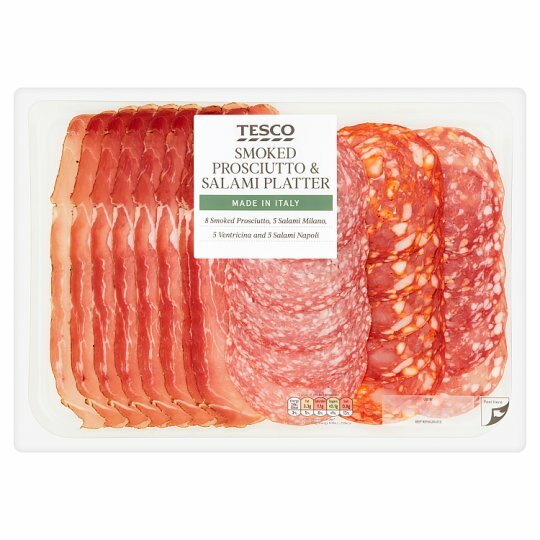 Prepared from 137g of Pork per 100g of Smoked Prosciutto.